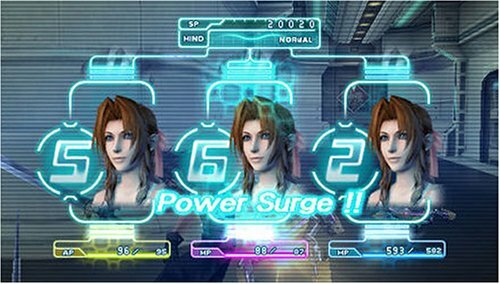 I played Crisis Core some time ago and wanted to comment on its Digital Mind Wave “Mechanic”. Aeris is actually spinning in her grave. It is a somewhat puzzling game feature and they way I thought about it changed a lot during my playtrough. First I was confused. Confusion then quickly turned into disaffection throughout most of the game. But in the very last minutes, the DMW suddenly gained a whole new meaning which made me question my take on it. But let’s start with the basics. 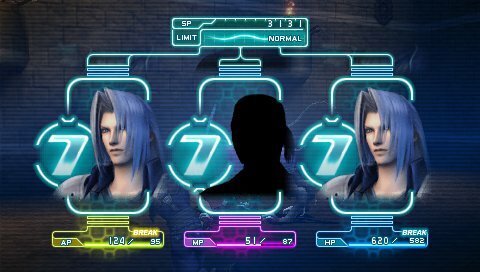 Final Fantasy VII: Crisis Core is a PSP spin-off to Final Fantasy VII. At some point around 2005 or so, Square Enix decided to milk their most popular Final Fantasy episode for all it’s worth. The most obvious thing would have been a modern remake of the old classic. Fans of the series have been demanding one for quite some time now. Square Enix decided to do everything BUT a remake. Instead, they made a solid game, a lackluster game and a forgettable direct-to-video movie, providing a stunning example of cross-media going horribly bland. The only thing tying the the three individual pieces of the puzzles are some shared assets, the Final Fantasy VII backstory and a copious amount of self-indulgent pandering to the fans. On the other hand, Square Enix does have an army of talented artists at their disposal so it’s just a question of the proper alignment of the stars for them to pop out a polished, solid game. That’s what Crisis Core is. A really nice looking, harmless distraction. It mixes Final-Fantasy-style ATB combat system with more action-oriented controls. It adds a whiff of Monster-Hunter-like missions. And cooks everything real good in the soup of schlocky Square Enix story with awesome production values. Considering all this, you end up with somewhat of an identity crisis. Which gets us at the core of the problem (”crisis core” – get it?). Crisis Core is a lot things at the same time but it never focuses on anything is specific. Plus, it has one hell of a legacy to live up to. So it’s left being somewhat undefined. Enter Digital Mind Wave. An in-game slot machine where portraits of characters from the game and numbers are constantly spinning and stopping in the background, spewing random power-ups. Every now and then, just when a you are about to get the same character on all three cylinders, the battle is interrupted for a close-up view of the slot machine so you can watch the combo spin into place. If you are “lucky”, you can watch series of cut-scenes, flashbacks and animations which may or may not result in a powerful attack. It’s a massive assault on the senses. A highly prominent, visual game feature. It’s immediately in your face. It establishes Crisis Core as “that one Final Fantasy game with the slot machine”. Sadly, that’s pretty much where the identity building stops. The flip-side of DMW is not only that’s is dazzling, it’s also semantically empty. The slot machine conjures images of gambling. It stands for neon signs in Las Vegas, gambling for the masses and the shady business of making money by tricking people. There is nothing about the setting of Crisis Core which echoes these sentiments. 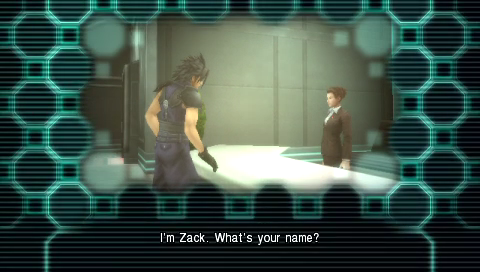 Zack is a mercenary fighter working for a big corporation. He is a sword fighter and very much concerned with questions of loyalty, friendship and honor. None of this has anything to do with the slot machine of DMW. In fact, DMW itself is actually never really addressed or explained in-game. As if it was some kind of feverish hallucination Zack endures every time he is in a combat situation. To make this mistake more apparent, the setting actually had plenty of potential to integrate the DMW more naturally. 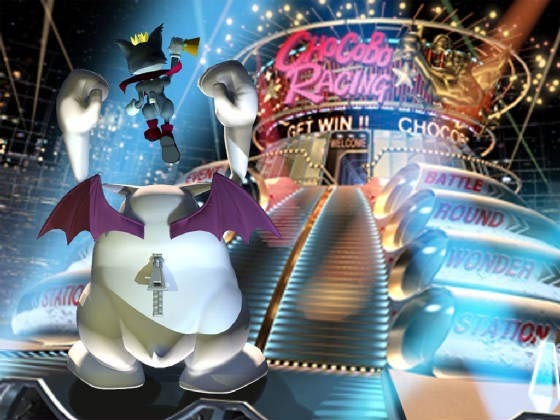 The original Final Fantasy VII had an entire city called Gold Saucer, which closely resembled the aesthetic of Las Vegas. The impotence of DMW as a means to establish identity is matched by its function as a game mechanic. When playing the game, at first sight, looked to me like DMW would be a complex game system enabling player agency. After all, gambling can have a lot of strategic depth. And DMW looks fairly substantial too! There are a lot of fancy numbers, graphs and bars. It looks like it’s something you are supposed to tweak to gain some epic advantage. But a few hours in, I was starting to wonder why the game wasn’t really explaining anything about it. I still haven’t gotten any means to manipulate it. It finally dawned on me. The DMW is actually completely non-interactive! Its rich interface is only a facade covering what essentially is a Pretend-Game-Mechanic. The slot machine works entirely on it own, constantly spewing out random effects. The player is not even pulling the lever of the one armed bandit! None of the numbers the machine is showing really matter, because there is nothing you can really do about it anyway. At least not directly. There is a status called “curse” which will freeze the slot machine, but that’s as much interaction as a power button on a DVD player is an interactive movie. There is an “Emotion Gauge” which can increase the chance of a summon appearing in general. But it is affected only either by story events or by yet ANOTHER summon. So it is pretty much random. The most you can affect the DMW is by equipping some special items late in the game. They can increase the chances of certain summons to pop up. But the effect is too subtle to be used in a tactical way. To grasp the magnitude of this omission, one just needs to compare this to another slot machine mini-game game. Take Super Mario Brothers 3, for example. This game has a slot machine game where the player stops all three cylinders individually by pressing a button. For a novice player, this is a game of chance. A skilled player can learn the timing to turn the odds to their favor. Even then, there is still some depth to the mini-game. Depending on the situation, different rewards may be more desirable. So planning, skill and luck is part of the game. As always, poster boy Mario is here to show how it’s done right. In contrast to this, the DMW is a dead corpse. There is not even luck involved, because that would suggest that some sort effect is anticipated. Instead, it’s really nothing more than random noise. But the player is forced to watch the results of the random noise in form of lengthy, repetitive animations anyway. The function of DMW is not to provide interaction with a rich system, but to merely convey the idea of interacting with a rich system. It’s an elaborate sham to make players believe they are playing a game more complex than they really are. Finally, let’s take a look at the narrative function of DMW. The system actually consist entirely of special effects and animations. As such, it taps deeply into the setting and the plot itself. The slot machine uses portraits of characters for symbols. And they aren’t just arbitrary. The characters are gradually unlocked as the story progresses, suggesting that the slot machine has some connection to the social network of the main character. There are multiple effects that can be triggered by the DMW. The most common one is a “summon”. 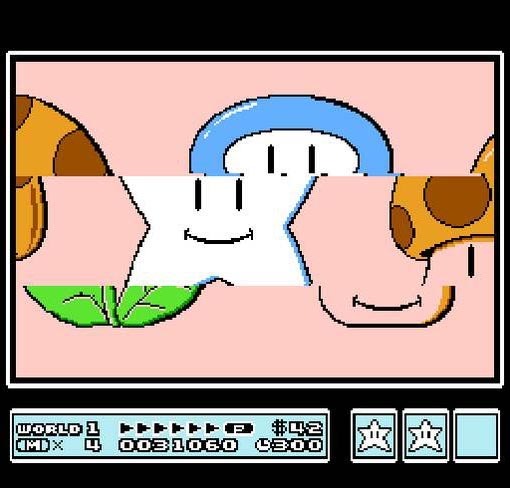 It occurs when the same character portrait lines up 3 times. A lengthy animation will play out during which the protagonist is somehow supported by the character in question. They mostly just boil down to either horribly cheesy or horribly translated, uplifting quotes, which inspire Zack to make some sort of special attack. It seems like DMW represents Zack remembering his friends and being stimulated by those memories. A notion that is supported by a different DWM effect. Every now and then, right before a summon, the game shows some additional scenes called Flashback Scenes. They are actual story cut-scenes, often showing a brief nugget of dialogue from past. Curiously, the flashbacks aren’t just re-cycled in-game cutscenes. They often show conversations which weren’t shown previously. They flesh out some details and some of them are actually significant contributions to the story. Again, the suggestion here is that DMW somehow represents how Zacks remembers things. Zack remembers an episode of getting turned down in a particular embarrassing way. And let me be clear on this. There is something deeply cynical about representing a person’s mind with a slot machine. It essentially denies the protagonist autonomous thought by suggesting his memories are governed by pure chance. Sadly, this interpretation fits disturbingly well to the protagonist’s personality. Zack is depicted as a cheerful, impulsive and simple-minded person after all. Even worse, using portraits of characters as symbols on a one-armed bandit represents a rather depressing approach to storytelling in general. The meta-game of Final Fantasy characters as marketing devices is allowed to invade their in-game narrative reality. This is echoed in various other instances such as in-game fan clubs devoted to some of the most iconic characters. It is an approach that prioritizes the Final Fantasy brand above the game’s narrative constancy and exposes all characters as hollow marketing puppets instead of human beings living in a rational world. Ironically, this actually cannibalizes the very foundations of why those characters got so popular in the first place. Congratulations, you won a story! That being said, there is one noteworthy moment in the game where DMW is used in a incredibly effective way. It includes some spoilers, but as always I suggest you continue reading. That part of the story is actually already depicted in Final Fantasy VII. At the end of the game, Zack chooses to make a final stand against an overwhelming army of enemies to protect his friend Cloud, who then in turn becomes the main character of Final Fantasy VII. If you played Final Fantasy VII and can’t remember, don’t worry. I completely missed that as well. In a very Final Fantasy manner, this final stand is represented as a genuine battle, but one that has been rigged. Zack is assaulted by a an infinite number of soldiers. He eventually succumbs to the attack. But every time his health drops to 0, a DMW summon is automatically triggered. We see triplets of characters line up and a flashback sequence shows a montage of some highly memorable moments with those characters. Afterwards, the character’s portraits are erased from the DMW and Zack regains some health to continue fighting a little longer. Once all characters but one are erased from the DMW, the scene fades away and we see the final moments of the battle. It’s gotten dark and most of the enemy soldiers are actually gone. However, Zack seems to be finally at the end of the line. He is approached by yet another group of enemies and he can hardly move. Another battle begins. One in which Zacks movements are very slow. The DMW appears to be actually broken. The cylinders don’t spin anymore. They blink in and out and seem to be stuck on a loop. As if the mechanism of the slot machine was damaged. After receiving some blows, Zack falls over. A soldier approaches and executes him. That shot jerks the DMW into motion. A final summon is executed. The character that lines up is, of course, none other than Aeris, Zack’s romance in this story. We are shown one last, distorted flashback About Aeris. The screen whites out and the story concludes with an FMW in which Zack passes his sword and the proverbial torch on to Cloud. To be perfectly honest, that sequence caught me by surprise. Until then, DMW seemed like a very abstract, flashy battle feature. Its meaning didn’t seem to go much further than a generator of shallow, entertaining special effects. But in the final sequence, the DMW is actually deliberately used to tell the story of Zack’s final thoughts. What, until then has been used to dispense buffs and special attacks, was now being used for a deeply emotional purpose. And at this point, I have been watching the DMW spin for over 50 hours of play time. So seeing it break down like that and stop at Aeris for the last time was ever more meaningful to me. 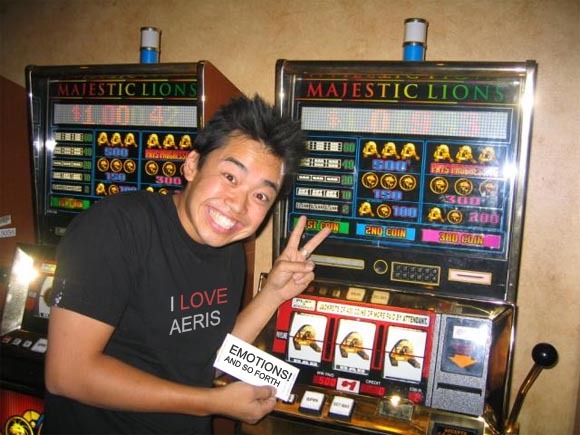 So in the end, Crisis Core managed to make me actually misty-eyed over a silly slot machine. Of course, this one scene doesn’t redeem all the above problems with the DMW. After all, this was just one short scene in a very long game. The reason why I find so remarkable is actually that it was so effective in spite of everything that is wrong with it. It could be an interesting precedence of using the elements of gameplay to convey emotional content and something worth exploring further. I feel like with a more integrated and less cynical approach, this could hint at a very powerful way of telling stories with games. Something I would love to explore myself in the future.